A hidden Class III paradise. In between the ancient ruins of ages gone by, you’ll find beautiful gorges and clean bedrock rapids, friendly locals and warm hospitality. Greece is home to world class wilderness whitewater, hidden away in remote valleys and deep canyons. Home to an ancient civilisation, and the birthplace of western society, Greece is also home to numerous adventures which await the intrepid paddler. Although relatively untouched by paddlers, the Greek mainland is home to world class wilderness whitewater, hidden away in remote valleys and deep canyons. In between the ancient ruins of ages gone by, you’ll find beautiful gorges and clean bedrock rapids, friendly locals and warm hospitality. Visiting areas largely unknown to the wider paddling community, this adventure will take you on a road trip off the beaten track, to experience Greek food in it’s native surrounds. Dining in small tavernas and staying in local hotels, you’ll travel through several paddling locations in Greece, experiencing rich culture, fantastic food, and untouched rivers. Combine this with warm weather and clear blue rivers, and you’ve got the perfect springtime paddling adventure. Greece Road Trip takes place on Class II/III+ whitewater. 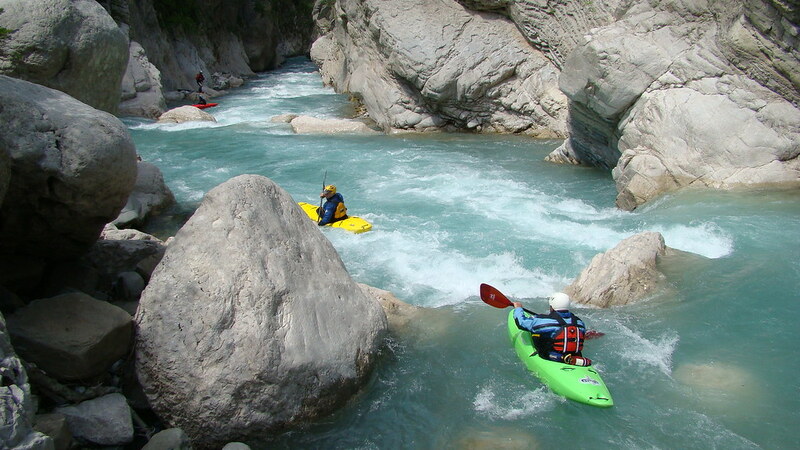 The Greece Road Trip is suitable for experienced paddlers who are able to paddle for 3 – 4 hours in a day on Class II/III. * The Greece Road Trip Paddling Adventure Picks up from Thessaloniki Airport to co-ordinate with the incoming flights on the Day of Arrival, and Drops off also accordingly on the Day of Departure.